A healthy, comfortable mattress is a key factor in getting a good night’s sleep. Having quality bedding to put on that mattress is just as important. The Natural Sleep Store has a great selection of natural and organic bedding to complement your organic mattress. 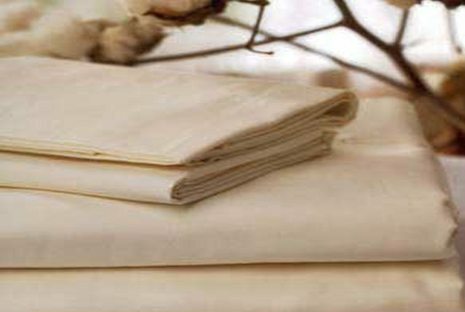 One of my favorite products that we carry is Gotcha Covered Organic Cotton Sheets. These sheets are at the top of my favorite list for so many reasons. What appealed to me first was the price. A set of Gotcha Covered sheets, depending on size, ranges from $100-$154.00. A good set of organic cotton sheets can easily be double that amount. They are made with 100% organic cotton, no dyes or chemicals are used in the process, so they are healthy. The sheets are 300 thread count and so, so soft. They are durable, holding up wash after wash. For the last year and a half, they have been the only sheets I’ve used, so they have been getting washed weekly. That’s about 78 turns in the washer and dryer, give or take a few. No fraying. No holes. No pilling unlike lesser thread count sheets. The more I wash them, the softer they feel. Gotcha Covered Organic Cotton Sheets are affordable, healthy, durable and soft, which makes them the perfect sheets for my organic latex mattress, and one of my favorite products offered by The Natural Sleep Store. This month, The Natural Sleep Store is giving away one of my very favorite products—a set of Gotcha Covered Organic Cotton Sheets. Anette P. of Houston TX is the winner of this contest! This contest is now closed. Contest ran from July 8th, 2013 to July 31st, 2013. No purchase necessary to win.